Bring a piece of history to your home. 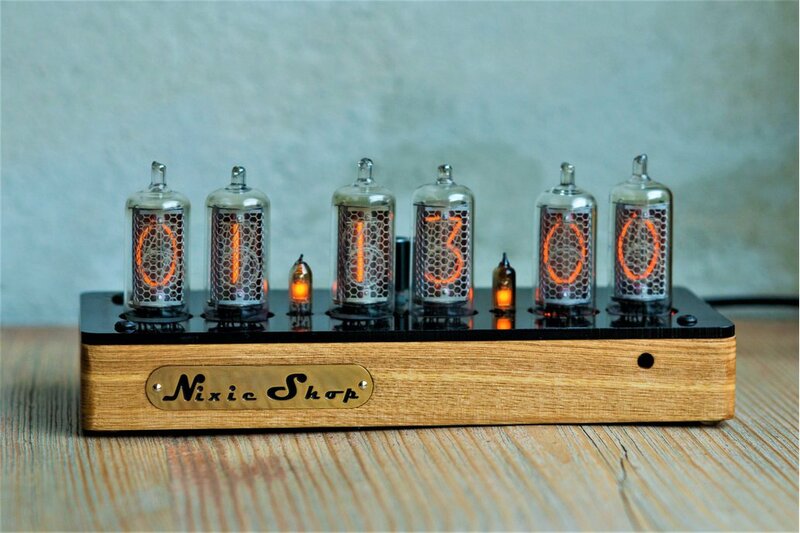 Become an owner of the Nixie Clock. This clock is a combination of modern technologies and vintage nixie tubes. It is a perfect gift for your friend and definitely will fit in any interior. Warm glowing of neon will fill your house with soft orange light at night and can serve as a night light. The clock is build with 6 IN-14 numeric nixie tubes in beautiful glossy acrylic case. Built-in RGB led back-light (with 10 levels for each channel) allows you to set your favorite color. Simple user-friendly menu (navigated with rotary encoder) drives you through all settings. Button click changes menu position and rotations changes values. The clock goes with IR control that duplicates the functionality of the knob on the clock. All the settings are available from the IR remote. All the tubes are in sockets. It simplify the repair in case any of the tubes burns out. Time accuracy is provided with built-in RTC (Real Time Clock) module and backuped with CR2032 battery while the clock is powered off. The clock has a human presence sensor that is a quite helpful for saving tubes lifetime. It switches the clock on only if someone is near the clock. It will go to sleep mode after few minutes it spoted someone. Every 1-5-th minute starts with spinning all numbers from 0 to 9. That is “Slot Machine” feature that helps to prevent cathode poisoning effect. It is very necessary as it prolongs lifespan of nixie tubes. There is a "sleep mode" feature which powers off all tubes at programmed time. This helps to prolong tubes lifetime. By default all tubes will be powered off from 1:00-7:00 at night. Case have following dimensions: height - 27 mm; width - 175 mm: lenght - 65 mm. Tube height is: 45 mm. Digits size in tube is - 18 mm. Current date is shown once in a 1-5 minutes in following format: DDMMYY, MMDDYY or YYMMDD. 12 or 24 hour formats are supported. There is also three modes for colon tubes: 1) Blinks once a second (is set as a default option); 2) permanently OFF; 3) permanently ON. Clock could be set to beep once an hour (when hour starts). This option is disabled by default. Buying our product you get completely assembled, ready for use and well tested clock. DC power adapter and user manual are provided.